EVERY FEBRUARY, PETE CLOSES his tailor shop and heads to Greece. Every year he says, “I’ve got to get you my bouzouki, Jim. It needs your attention.” The strings buzz at its 8th fret and up from worn frets. But he never actually gives me his instrument. Until this year. He opens the case and again explains what he wants, repeating those three magic words every luthier wants to hear, “Whatever you think is best.” Doesn’t he know my favorite Oscar Wilde quote? Experience is simply the name we give our mistakes. “Pete, what about this big crack on top?” Pete had never noticed a clean 6″ crack through its white spruce top. It gets worse. A second top rack. The 12″ separation among its sfendamos side ribs plus a 6″ opening further toward the back. A casualty of a major συμπόσιον; someone must have gotten pretty well knocked on their head with Pete’s bouzouki! Big jobs are nothing but a collection of small jobs. But after all that gluing and sanding, it’s clear Pete’s bouzouki will want its top refinished. Lacking a spray booth and years of experience, I turn to a name luthiers have trusted for decades. Behlen. 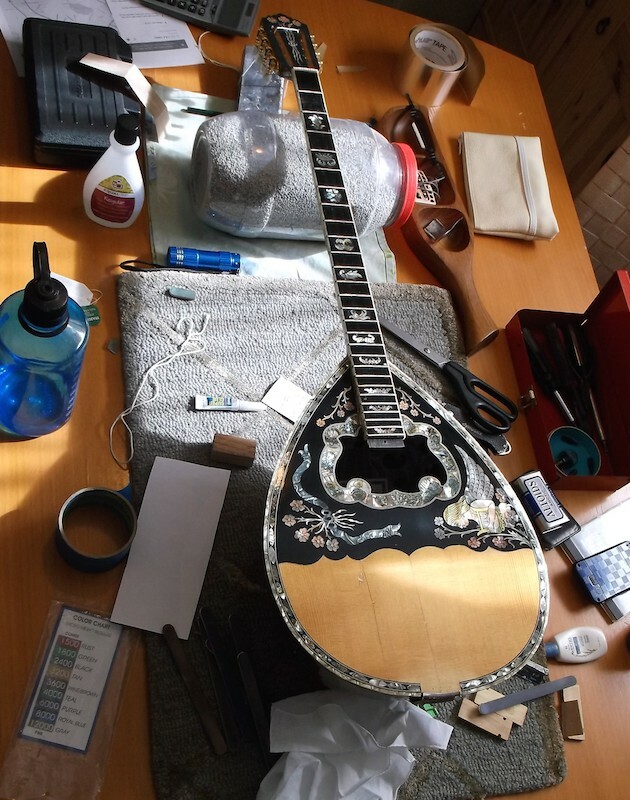 I ordered their spray lacquer, prepared the top, and before you know it, I have Pete’s bouzouki on its way to looking like it came out of the Borgada Spa! A few holes in my knowledge base are quickly plugged. 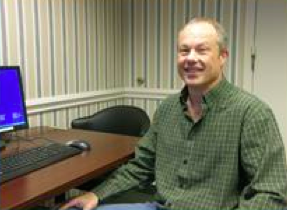 Phillip Pritchard, Mohawk Finishing Products Technical Service Representative, has just returned my call. With his gentle North Carolina accent, he seems respectful even of the nitrocellulose lacquer of which we speak. Phillip’s insights into scuffing, sanding, buffing, polishing, the “Cut & Rub”, are so comprehensive, we link to his reply email. American Toolbox has restored several instrument, notably Hugh’s Collings mandolin & Santa Cruz guitar, several Guild guitars, a few others. 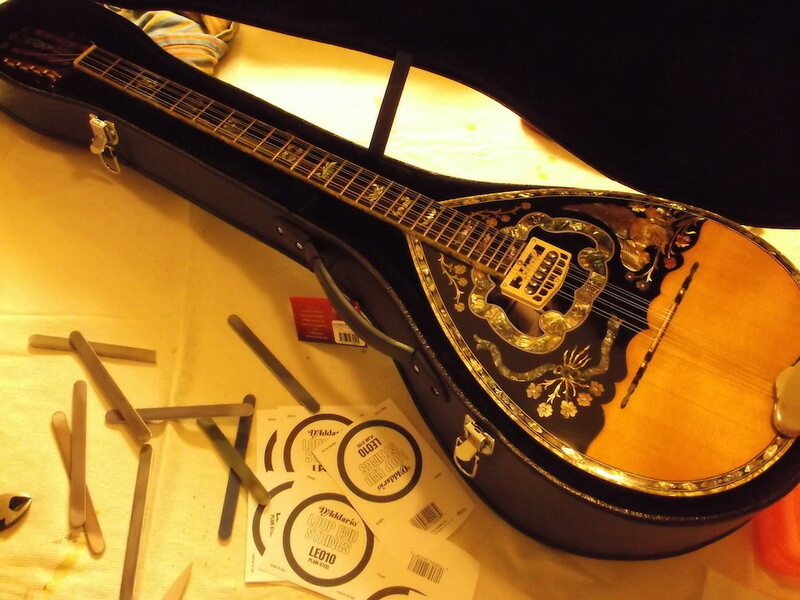 Pete’s bouzouki has been more complicated. Not as hard as Steve Field’s Joh. Bapt. Schweitzer 1813 violin, but major enough. Thanks, Behlen! You made me look like a pro! Special thanks to Jayne Henderson for her advice and guidance. This entry was posted in Craftsman / Artist, Music, Product Review and tagged Behlen Stringed Instrument Lacquer, cut and rub, how to scuff coat lacquer, how to scuff coat nitrocellulose, jayne henderson, jim sergovic luthier, Joh. Bapt. Schweitzer 1813, Mohawk Finishing Products, Phillip Pritchard Mohawk, scuff cut rub.